Prime domain names, especially those ending in “.com,” have long been desirable, hard to find and extremely expensive. With Social Networks gaining popularity, it’s no surprise that account names are starting to be treated like domain names. Exxon Mobil failed to claim their name on Twitter and was forced to deal with reputation management problems, when animposter started tweeting using @ExxonMobilCorp. Jack Canfield, founder and CEO of Chicken Soup for the Soul Enterprises, had to take a different user name because he didn’t act quickly enough to secure his full name (he has @J_Canfield, not@JackCanfield). The same thing happened to web developer community and book publisher SitePoint, which was forced to settle for @sitepointdotcom, rather than @sitepoint. This goes without saying that you don’t need a profile to sites with irrelevant users. But you should be worried about all the rest. Which network will be the next big thing? Which one will be the next Facebook? Better to have your personal or brands handle forehand. Check out the availability of your personal or brands handle from Namechk.com in popular social networks. I wouldn’t be suprised if Adidas would buy that Twitter handle for $1000 or more. 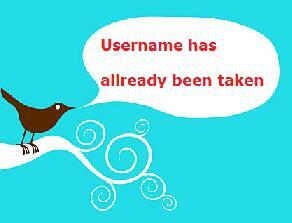 That really depends if the current holder of this username is willing to sell it. Maybe he or she has a cleaver strategy for holding on to that username and wait until Twitter is more popular and therefore earn more money out of this sale. I personally think that Twitter is slowly loosing its popularity among regular people and is more of a playground for marketing-oriented people. http://ud.com nameck is another great tool for checking domain names, social usernames and trademarks.